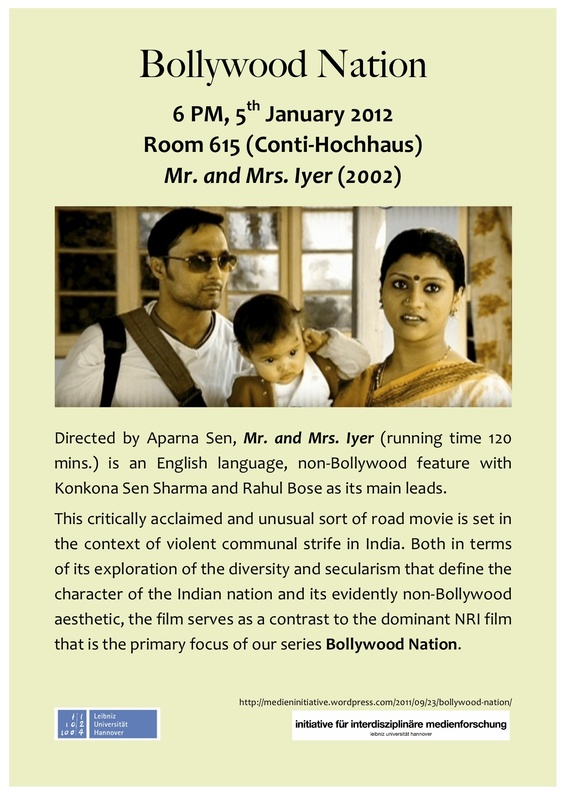 On Thursday, January 5, 2012, we will be screening the fourth film in our Bollywood Nation series: Mr. and Mrs. Iyer. As usual, the screening will begin at 6:00 PM (room 615 in the Conti-Hochhaus). As indicated on our poster above, the 2002 film serves in several respects as a contrast to the other films in our series. More information about the film can be found on imdb.com. Die Universität Hamburg und die Roland Faelske-Stiftung loben im Jahr 2012 zum zweiten Mal den Roland Faelske-Preis für Comic und Animationsfilm aus. Ausgezeihnet werden Studierende und Promovenden für herausragende Arbeiten aus dem Themenbereich ‘Comic’ oder ‘Animationsfilm’. und für die beste Dissertation, dotiert mit 3.000 Euro. Annahmeschluss für empfohlene Arbeiten ist der 30. Juni 2012. Die Zulassungsbedingungen entnehmen Sie bitte der ausführlichen Ausschreibung sowie der ‘Richtlinie für die Verleihung des Roland Faelske-Preises’. Auskünfte erteilt Herr Prof. Dr. Markus Kuhn. This reminded me of Niklas Luhmann’s theory of media, itself a sort of “remediation” of psychologist Fritz Heider’s distinction of medium vs. thing, which comes down to a distinction between a “loose coupling” and a “tight coupling” of elements of a given sort (see Heider’s Ding und Medium). For Luhmann, mediality consists in the relation between a loosely coupled “medial substrate” and the tightly coupled “forms” that it is capable of assuming — or, in other words, in the “operative deployment of the difference of medial substrate and form” (Luhmann, Die Gesellschaft der Gesellschaft 195; my translation), which is itself relative to an observer or system. “Variety through repetition” is the formal basis of the Internet meme, as well as being a principle of seriality and a formal description of mediality itself (following Luhmann). As I recently argued for Lady Gaga, Nyan Cat can also be dubbed a “serial media remix”: Nyan Cat is the instantly recognizable, iconically redundant substrate out of which ever new forms are produced; these forms become available, in turn, for sampling, and they serve as the substrate of a higher-order mediality, thus proliferating in a (non-linear) serial explosion. Long live Nyan Cat: memifier of Internets, proliferator of serial forms, and media remixer extraordinaire! All your substrate are belong to us!!!11! Heider, Fritz. Ding und Medium. 1926. Berlin: Kulturverlag Kadmos, 2005. _____. Die Kunst der Gesellschaft. Frankfurt: Suhrkamp, 1995. Apart from superheroes, politics, Photoshop, and video games (see yesterday’s post), two other obsessions interests of this blog over the past several months have been Bollywood and Lady Gaga. There are, of course, reasons for all of these things: my interest in superheroes is related to my work on comics, and they’ve been brought together with American politics (and especially #OWS) in ways that highlight the importance of visual and social media at the current moment, while, at the same time, I’ve been teaching a seminar on game studies this semester. Then there’s our still ongoing Bollywood Nation film series (in which three films have been screened so far, all starring Shah Rukh Khan), and I gave a presentation on Gaga last week at our conference on “Cultural Distinctions Remediated.” Strangely, all of these things are starting to come together: here, Shah Rukh Khan interviews Gaga on Indian television, going so far as to raise the prospect of Gaga acting in a Bollywood movie! How did I miss this? 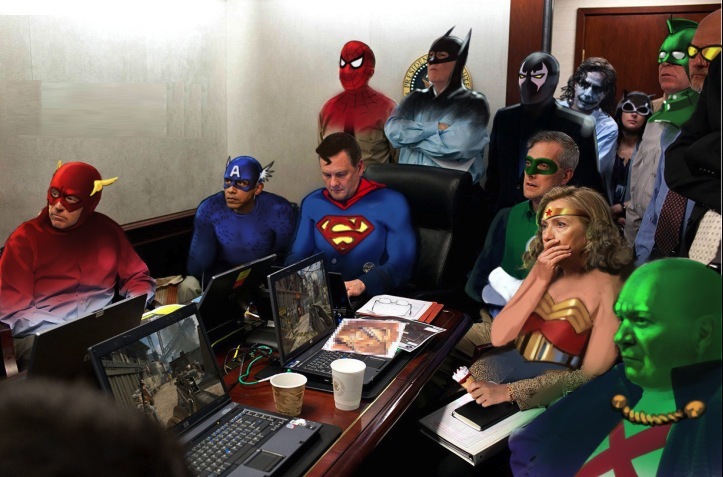 Anyway, now that I’ve discovered this ingenious reworking of the photo taken May 1, 2011, as news of Osama bin Laden’s death came to the White House situation room, I thought I’d put it up here to continue the blog’s occasional focus on the points of contact between Photoshop, superheroes, and politics (and video games: look at their computer screens!). Recently I posted about a paper of mine coming out in the open-access journal Phenomenology & Practice, entitled “Faith in Technology: Televangelism and the Mediation of Immediate Experience.” Now, my article, along with the new issue of P & P, has gone online (the entire contents can be found here), and I hope that you’ll take a look. Anyway, as I mentioned a couple of weeks ago, I think that the “techno-phenomenological” approach I have taken towards the topic of televangelism may also be adaptable to fictional narrative television, and that it might thus provide a complement to — not a replacement for — more traditional (narratological-formal and industrial-social-contextual) approaches to television studies. This remains to be seen, of course, and I look forward to hearing your comments on the text itself and on the prospects of adapting its methodology to other sorts of projects. Incidentally, though, since the time of suggesting that such adaptation might be possible, it has occurred to me that I once undertook a very cursory attempt at doing just that: in a very short essay, entitled “Techno-Habitats and Media Habits: Reflections on Contemporary Children’s Television” (originally published in Philament 12), I implicitly assumed a techno-phenomenological approach to young children’s TV shows like Teletubbies, Bob the Builder, or Lunar Jim. That paper, roughly contemporary with my initial work on the televangelism paper, just sketched out some ideas, presenting them in a literally essayistic manner, while the theoretical and methodological underpinnings were not explored. Now, with the publication of the televangelism paper, the methodology in particular has become available for inspection (the deeper theoretical implications, on the other hand, remain buried in the media-philosophical Part Two of my dissertation, Postnaturalism: Frankenstein, Film, and the Anthropotechnical Interface). 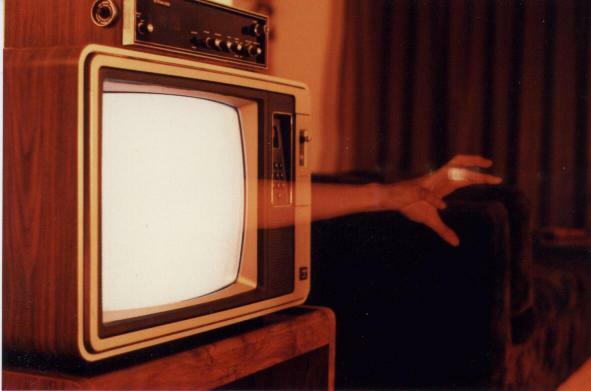 So please take a look and let me know what you think about the prospects for a techno-phenomenological form of television studies.